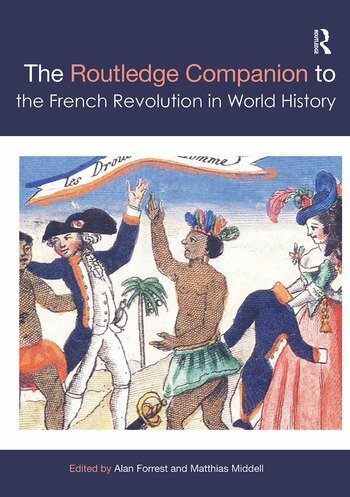 The Routledge Companion to the French Revolution in World History engages with some of the most recent trends in French revolutionary scholarship by considering the Revolution in its global context. Across seventeen chapters an international team of contributors examine the impact of the Revolution not only on its European neighbours but on Latin America, North America and Africa, assess how far events there impacted on the Revolution in France, and suggest something of the Revolution’s enduring legacy in the modern world. The Companion views the French Revolution through a deliberately wide lens. The first section deals with its global repercussions from the Mediterranean to the Caribbean and includes a discussion of major insurrections such as those in Haiti and Venezuela. Three chapters then dissect the often complex and entangled relations with other revolutionary movements, in seventeenth-century Britain, the American colonies and Meiji Japan. The focus then switches to international involvement in the events of 1789 and the circulation of ideas, people, goods and capital. In a final section contributors throw light on how the Revolution was and is still remembered across the globe, with chapters on Russia, China and Australasia. An introduction by the editors places the Revolution in its political, historical and historiographical context. The Routledge Companion to the French Revolution in World History is a timely and important contribution to scholarship of the French Revolution. Alan Forrest is emeritus professor of modern history at the University of York. His publications include Paris, the Provinces and the French Revolution (2004); The Legacy of the French Revolutionary Wars: The Nation-in-Arms in French Republican Memory (2009); Napoleon: Life, Legacy and Image (2011); and, most recently, Waterloo (2015). Matthias Middell is the director of the Global and European Studies Institute of the University of Leipzig. His publications include Transnational Challenges to National History Writing (2013); 1989 in a Global Perspective (2014); and, most recently, Multiple Secularities beyond the West: Religion and Modernity in the Global Age (2015). "Anyone interested in the French Revolution's place in world history must start with this wide-ranging and innovative volume. The most recent and original scholarship is brought together by a group of international historians to revitalize one of the most important areas of historical scholarship. The French Revolution, which had been for so long studied within a narrow national context, can only truly be understood within the context of world developments." "These essays offer a much needed and thought-provoking exploration of the global origins and repercussions of the French Revolution. Combining synthesis with original scholarship, this invaluable collection challenges us to rethink not only the French Revolution, but also revolution itself as an international process."